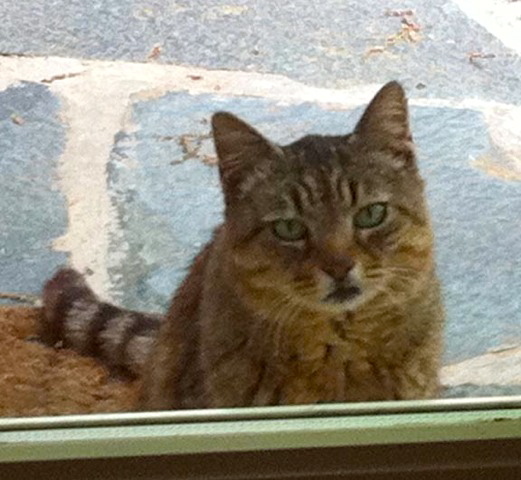 In recent days a very pretty tabby cat with green eyes has taken up residence in the yard of PGC member Mary Leslie. Mary is allergic to cats and unfortunately can’t keep her. She was obviously a pet at one time, but stays on Mary’s back patio most of the time now. Mary has posted notices but nobody has come forward to claim the cat. The kitty’s a little skittish, understandably, and very skinny. The cat doesn’t appear to be very old, and she’s in dire need of several good meals and a loving home. Don't you want this sweet kitty? This entry was posted in Alerts, Lost Pets. Bookmark the permalink.